Roxane Townsend is a physician executive specializing in the integration of complex clinical enterprises, transformation of academic health systems, and making public and private health systems more profitable. 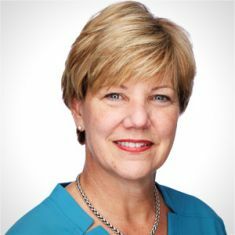 She consults with HMA clients nationwide and supports strategic planning and incubator projects for the Healthcare Transformation Institute. Her combination of clinical and operational expertise inspires trust and confidence. She is known for her ability to convene, engage and build consensus among diverse stakeholders, spot inefficiencies, overcome barriers and maximize revenue while maintaining focus on the quality of patient care. Prior to joining HMA, Roxane was CEO of the University of Arkansas Medical Center and vice chancellor for clinical programs. Backed by a high performing team, she guided the enterprise from a budget deficit to a $30 million surplus in just three years. She led integration of core clinical services and 15 specialty service lines including behavioral health, cancer and neurosciences. Ambulatory throughput increased 18 percent and length of stay for trauma patients dropped 25 percent. She also championed a shift in operating room scheduling control to anesthesiology, resulting in a double digit increase in surgical volume without the addition of any new operating rooms. In the wake of Hurricane Katrina, Roxane served as medical director for the Louisiana Medicaid program and eventually took the helm as secretary of the Louisiana Department of Health and Hospitals. She participated in the redesign of the devastated healthcare system in New Orleans and served on the executive steering committee for the planning and design of the new University Medical Center to replace Charity Hospital that was destroyed by the storm. Her own experience, as a doctor treating Katrina evacuees in the Superdome, motivates her continued advocacy of health information technology adoption, integration and interoperability. As assistant vice president for health systems at Louisiana State University, Roxane led the team who successfully planned a system-wide implementation of an interoperable electronic medical record in the LSU Health System. She also achieved a $40 million reduction in expenses at the interim LSU public hospital while maintaining services to the most vulnerable patients in New Orleans. Roxane was pivotal in forming the Partnership for Healthy Arkansas (PHA), a shared services organization comprised of four previous market competitors. The Partnership collaborates to eliminate duplicative services and increase access through population health and care management initiatives including a new provider-led managed care behavioral health model. Outside of the PHA, she led efforts that resulted in joint services such as vascular surgery with another major health system in Little Rock. This saved the expense of recruiting another surgeon and provides high quality care utilizing the same experts at two medical centers. Roxane earned her M.D. and completed her residency in internal medicine at Louisiana State University School of Medicine. She received her bachelor’s degree in nursing from Duquesne University. When not immersed in a thrilling murder mystery novel, Roxane enjoys running half-marathons.